SAN DIEGO, October 9, 2018 – On Saturday, the first-ever San Diego Clean Energy Fair took place at the San Diego Electrical Training Center. Over 40 partners came together to make the event possible, and hundreds of guests enjoyed a day full of education aimed at giving San Diegans the tools to help move the region to 100 percent clean energy. 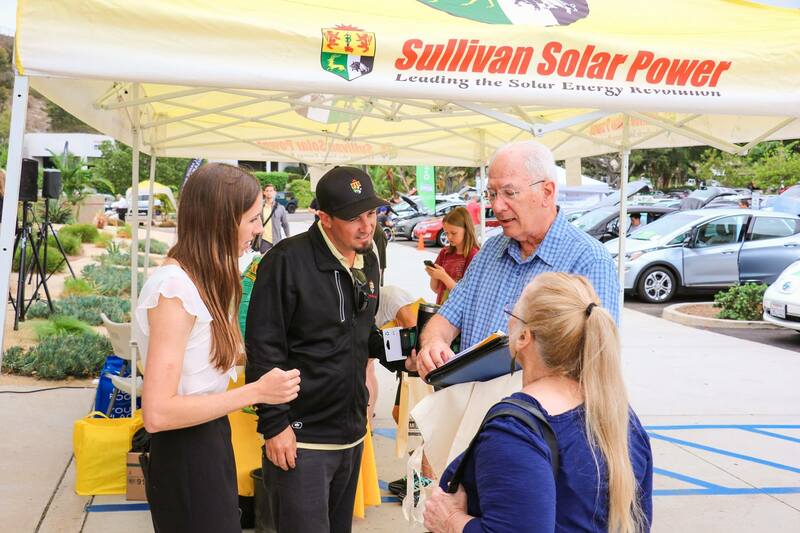 The Clean Energy Fair provided information about solar power, energy storage, energy efficiency, electric vehicles, workforce development and more. This grassroots educational initiative came at a time when clean energy is abuzz in the media, electricity rates have reached record highs and climate-related natural disasters are more frequent and devastating than ever. The economic, social and environmental demand for clean energy is clear. The solutions, however, seem to remain a mystery to the average consumer. Initiatives from the San Diego Clean Energy Fair aimed to change that by offering free education and activities to help propel San Diego forward in its quest for fossil fuel-free energy. We were thrilled to be a part of the San Diego Clean Energy Fair, teaching attendees about pairing local solar with electric vehicles, which gives our community cleaner air and a stronger economy. Attendees benefited from an array of relevant workshops including Solar and Energy Storage 101, where nationally certified energy practitioners provided thorough and up-to-date information on how solar works, available warranties, incentive programs, recent policy changes as well as how rate increases from San Diego Gas & Electric pertain to solar customers. LG Chem’s Linh Tran spoke in depth about energy storage – how it’s made, the financial benefit it provides, what to look for from an energy storage manufacturer and more. Workshops pertaining to businesses and institutions were also on the agenda, including Commercial Solar 101 and Commercial Energy Storage Solutions. High-profile case studies made rich content and an invaluable learning opportunity for fiscal and eco-conscious businesses. While the pledge for clean energy helps to reduce our reliance on foreign fossil fuels, it also drives a demand for local jobs in renewables. To meet this demand, the International Brotherhood of Electrical Workers Local 569 offered a session on the San Diego Electrical Joint Apprenticeship, providing information to those interested in joining the solar industry as electricians. In addition, participants explored electric and hybrid vehicles at the electric vehicle showcase and learned how to harness the sun to power his or her vehicle. Representatives from Chevrolet, Nissan, Kia, Fiat and Zero Motorcycles were present with a variety of electric and hybrid vehicle options. They were also joined by members from the Electric Vehicle Association of San Diego, sharing their vehicles and experiences with attendees. Nonprofits and businesses brought the latest technologies together in one place at the cleantech fair. There was a screening of the documentary film “Catching the Sun,” as well as a solar oven demonstration by Solar Cookers International and various educational activities for children. The San Diego Clean Energy Fair website offers more information about the event, its supporters and participants. Learn more by visiting www.cleanenergyfair.org.